Having broken all major support (8240 & 8120) last week and closed below them, Nifty likely to continue its downward journey towards 7400 this week. If you look closely the Nifty chart at different time frames one thing is evident, that volumes spike up at every fall, indicating how the bears are utilizing the opportunity to build short with every short lived raise. 7940 would act as a minor support for the day, however having this level broken last week, we can see this level breaking at ease by the bears. In short, especially the last 3 days of this week would be controlled mainly by the bears. 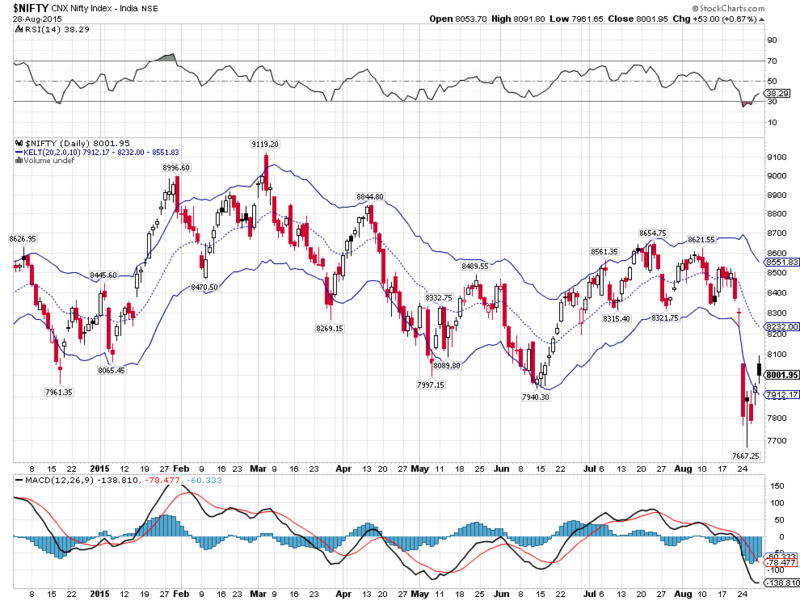 Technically speaking, on the daily chart of Nifty I am looking for a move in RSI towards 50 and MACD to converge a little more. These would give more strength to the bears to push the Nifty harder towards 7400 in the second half of this week. Stay calm as once this turbulent wave is over, we are going to see a major upside move.